A new interest that I’ve developed since the birth of my eldest son, Philip, is to learn more about Montessori methods. I’m a big fan of Edoki Academy’s Montessori math apps - I think they are of high quality and very helpful for Philip and his brother. Today I’m really excited to share with you a brand new app from these developers, called Montessori Math: Add & Subtract Large Numbers. It’s a sequel to Montessori 1st Operations, a great math app that I reviewed a couple of months ago. 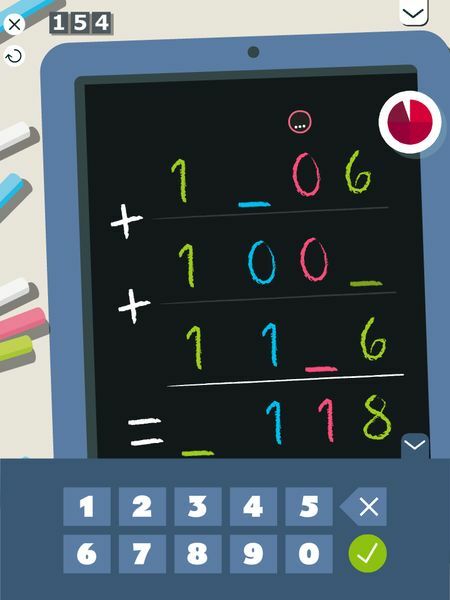 This brand new app builds on the basic addition and subtraction concepts that juniors have learned in the prequel app, and focuses on how to deal with large numbers. If this is your first time playing, there are two paths that I recommend. The first one is to go through the suggested path of learning how to add numbers using the Stamp Game and Bead Frame. This approach works well if you’re already familiar with these fundamental Montessori materials. If not, I’d suggest the second path, i.e. via the Toolbox. I personally prefer the Toolbox route since it lets juniors to first familiarize themselves with the methods used in the app. Montessori Math: Add & Subtract Large Numbers is an excellent app that teaches kids to add and subtract numbers. The Toolbox is the perfect gateway for you to understand the brilliance of Montessori methods. As a self-professed math geek, I’m really impressed with the way Montessori approaches these subjects. In the Stamp Game, juniors will be asked to represent a number (small or large) using color-coded stamps. The basic units are represented with green stamps, whereas the tens and hundreds are each represented with blue and red stamps. Each of these stamps have a number indicating its value. For example, the blue stamps have the number 10 written on it, whereas the red stamps have the number 100 on it. So even though the stamps representing thousands use the same green color as the stamps representing ones, juniors won’t make the mistakes thanks to the number written on the stamps. The Toolbox allows juniors to get familiar with the color-coded stamps before learning to perform addition using these stamps. The Toolbox will show a random number, such as 7,584, and juniors are asked to drag the appropriate stamps to represent that number. After placing seven green stamps representing thousands, five red stamps representing hundreds, eight blue stamps representing tens, and four green stamps representing ones, the challenge is complete. The Toolbox will show a new random number for you to practice until you hit the close button on the top left corner to switch to another section. Putting color-coded and numbered stamps into their respective columns help juniors to grasp the concept of representing numbers in 1000s, 100s, 10s, and 1s. This will be essential to explain the concepts of carry-over and borrowing later on. This will also help them to think in columns, preparing them for more abstract techniques introduced by Bead Frame and Magic Slate methods. The second Montessori method introduced in the Toolbox is Bead Frame. In this method numbers are represented as color-coded beads arranged in columns similar to a Russian abacus. The same color conventions are used here, where green represents 1s and 1000s, and blue and red each represent 10s and 100s. 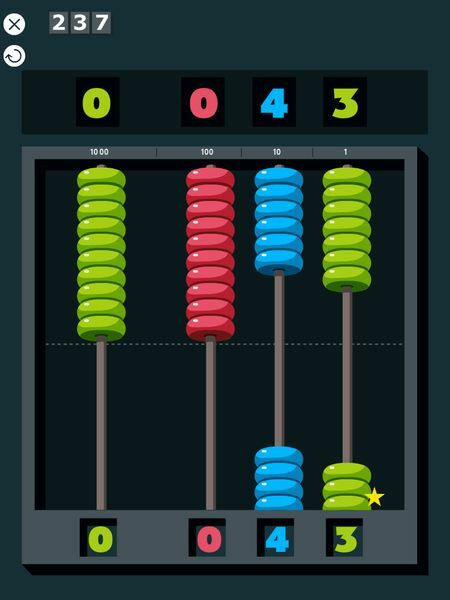 To help juniors differentiate between each columns, the app shows a small unit number on top of each column to indicate the value of each colored bead. In Bead Frame, juniors will be asked to represent a random number in beads. For example, to represent the number 0043, juniors need to move four blue beads representing 10s and three green beads representing 1s downwards. Later in the addition/subtraction mode, juniors will learn how to move beads up and down to represent the addition, subtraction, carrying and borrowing operations. Finally, the last section in the Toolbox shows you addition and subtraction tables that juniors can use to remind themselves about the basic of these operations. These tables are exactly the same with the ones you’d find in the prequel app, where juniors can also learn how to reconstruct these tables from scratch by performing the addition and subtraction operations one at a time. Colorful stamps help kids to differentiate between numbers. Once you’re familiar with how you can represent numbers with stamps and beads, you’re ready to learn addition and subtraction the Montessori way. The methods are placed in the order of the suggested learning curve, from a more concrete method to a more abstract method. I’d suggest starting with Stamp Game before moving on to Bead Frame and Magic Slate. In Stamp Game, you will be shown two random numbers: one placed on the top half of the board and the other on the bottom half. Using the color-coded stamps, you’re asked to represent each number correctly before dragging the plus button to the right. The app will then combine all the stamps according to their respective columns. If you see a column containing more than 10 stamps, you can select a group of 10 of those stamps and drag them to their neighboring column on the left, and have those stamps converted into a stamp valuing 10x the old stamp. For example, if you add 12 to 99, you will see 10 blue stamps and 11 green stamps. First you drag 10 green stamps and move it to the blue column to have it converted into a blue stamp. Now you have 11 blue stamps and one green stamp. Then you drag 10 blue stamps and move it to the red column to have it converted into a red stamp. As a result you have one red stamp, one blue stamp, and one green stamp, yielding the result of 111. The Stamp Game is meant as an introductory method. That’s why it’s only limited to two operands. Once your juniors are ready, they can move on to the subsequent methods where they will encounter operations with three or four operands. While performing additions with the Bead Frame method, I’d suggest letting kids try to solve each column starting from the least significant digit. This approach will allow them to tackle any number of operands, and to move to a more abstract method (such as Magic Slate or even mental calculation) without any problem. I’d also suggest letting them add numbers by counting one at a time. For example, if you want to add 5 to 6, you’d start with six beads and add one bead at a time until you’ve added all five beads. Each time you reach 10 beads in a column, pause your counting, move all the beads back up, add one bead from the neighboring column on the left, and continue your counting. Finally, in the Magic Slate method, juniors will practice addition in a more abstract way, dealing with numbers only. No more stamps nor beads to represent the numbers. It’s basically the same method that an adult would use solve the problem, complete with small markers on top of each column to indicate carry-overs. Magic Slate allows kids to practice subtraction in a more abstract way. Learning how to do subtraction is very similar to the way you learn addition, only this time all challenges are limited to two operands. Instead of grouping 10 stamps/beads to exchange it forward to a higher stamp/bead, subtraction would let you borrow one stamp/bead from a higher-value column and exchange it for 10 stamps/beads of the lower-value column to solve the problem. The Stamp Game allows juniors to see a nice animation of this process. Dragging a red stamp over to the blue column will automatically convert it to 10 blue columns. It’s an excellent way for juniors to learn the concept of borrowing. Unlike with the Bead Frame method, I’d suggest starting with the number on top (the minuend) and represent it as beads in all four columns. Start subtracting from the least significant digit by moving up one bead at a time. Each time you need more beads to subtract, i.e., when there are no more bead to move up, pause the counting, subtract a bead from the next higher-value column, add 10 beads back to the active column, and continue your counting. In the Magic Slate method, you will see the borrowing concept as striking a higher number and add a prefix of 1 to the current digit of the minuend. For example, to subtract 72 with 25, you will need to borrow a digit of tens from 7 and convert it to 10 digits of ones to add to 2. You can now subtract 12 with 5 to get 7 ones, and 6 with 2 to get 4 tens, yielding the final result of 47. There are mini games to practice the concepts that you’ve learned. In math, practice makes perfect. Knowing this, the developers included three mini games in the Playbox section. The first game, Missing Digits, will show a Magic Slate containing a problem that you need to solve by identifying the missing digits. I really enjoy playing this game as it offers a different level of exercise on top of your normal fill-in-the-blank question. It reminds me of verbal arithmetic puzzles I used to play with on high school. If you want a more straightforward fill-in-the-blank question, you might want to try the Wiz Quiz game. If you want to try a more visual and fun game, you can try the Bubble Game. This one is more like a multiple choice question where the options to a problem float around in bubbles. All of these mini games are run in a series of 120 seconds. There’s a timer on the top right corner as you play. The idea is to try getting as many correct answers as possible within the 2-minute period. The app will automatically restart a new 2-minute session until you tap on the close icon on the top left corner to switch to another game. You can adjust the difficulty settings for each user of the app. 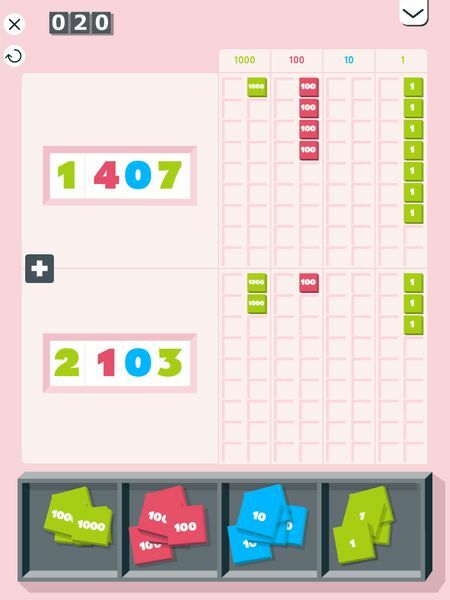 Montessori Math: Add & Subtract Large Numbers allows you to create multiple user profiles, so you can share the iPad with more than one player at home or in the classroom. The developers also included a dynamic progression algorithm which allows the game to automatically adapt its difficulty level for each user profile based on the way the player solves the current set of problems. If you want you can also set the difficulty to any one of the four predetermined levels. The app allows you to fine tune the game settings to suit the current learning progress of each user profile. Similar to its prequel app, you can exchange the points that you collect throughout the learning sections and the mini games with items that you can buy in the Monster Store. You can then go to the Monster Lab to play with your own unique monsters. Finally, if you want to learn more about the Montessori methods in facilitating juniors to learn addition and subtraction, you should definitely check out the Note to Parents section. It contains excellent description of each method used in the app, and how to interact with the app should your juniors have problems with it. I personally think it has an awesome educational value, even for a math-geek parent like me. Montessori Math: Add & Subtract Large Numbers is an excellent sequel to the Montessori Math: 1st Operations. As someone who loves math, I highly recommend the Montessori methods used in this app. The app is nicely designed to make these methods even easier to comprehend even for juniors as young as six years old. Splash Math Kindergarten. Excellent jungle-themed math workbook rewards practice with fun interactions.